The Southern Virginia Regional Alliance and the Industrial Development Authority (IDA) of Halifax County hosted Secretary of Commerce and Trade Brian Ball, Virginia Economic Development Partnership (VEDP) President and CEO Stephen Moret, members of their staff and others for a round table event held late last month. 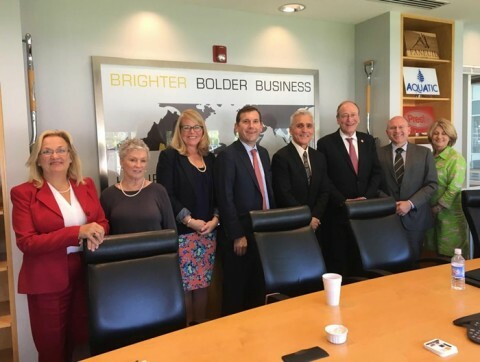 The round table session, held at Southern Virginia Technology Park, included manufacturing and business representatives as well as Sen. Frank Ruff; Legislative Assistant to Del. James Edmunds Shelia Bradley; and representatives from GO Virginia, Mid-Atlantic Broadband Communities Corporation (MBC), ChemQuest Technology Institute (CTI), Southern Virginia Higher Education Center and the Halifax IDA. The discussion focused on the vision for rural economic development. Topics addressed included broadband technology, inclusive of MBC’s work in the region; CTI’s research for companies worldwide; the Henrietta Lacks Life Science Center plans for the region; and relevant pending legislation. Ball and Moret provided updates on Gov. Ralph Northam and his cabinet’s commitment to rural Virginia and key areas of focus. Moret also shared details of the VEDP strategic plan and implications for the region. Sen. Ruff and Bradley also provided feedback at the state level. The Industrial Development Authority is tasked with improving Halifax County through increased employment and economic growth. In order to best accomplish this mission, the IDA attracts and cultivates business and industry through a comprehensive network of partners and community assets. Established in 1971, the IDA is a separately chartered political subdivision of the commonwealth, allowing the group to act with exceptional speed and agility, similar to successful businesses. The localities in the Southern Virginia Regional Alliance developed a mission of collaboration to create a strong economy to benefit the citizens of the Southern Virginia Region. Partners include Halifax County, Patrick County, Pittsylvania County, the city of Danville and the Institute for Advanced Learning and Research. Photo: Halifax leaders and state officials who discussed opportunities for Halifax County and the Southern Virginia region are (from left) Linda Green, executive director of Southern Virginia Regional Alliance; Nancy Pool, administrative director of the GO Virginia Region 3 and Halifax IDA board member; Kristy Johnson, deputy director for Halifax IDA; El Koubi, executive vice president of Virginia Economic Development Partnership; Halifax County Executive Director Matt Leonard; Secretary of Commerce and Trade Brian Ball; Stephen Moret, president and CEO of Virginia Economic Development Partnership; and Shelia Bradley, legislative assistant to Del. James Edmunds.